Boston, Dec. 17, 2015, — Youth soccer players, a long snowy winter is cancelling good chances of playing soccer outdoors. Do you have a strong hunger for footballing due to inclement weather conditions? Stronger than ever? 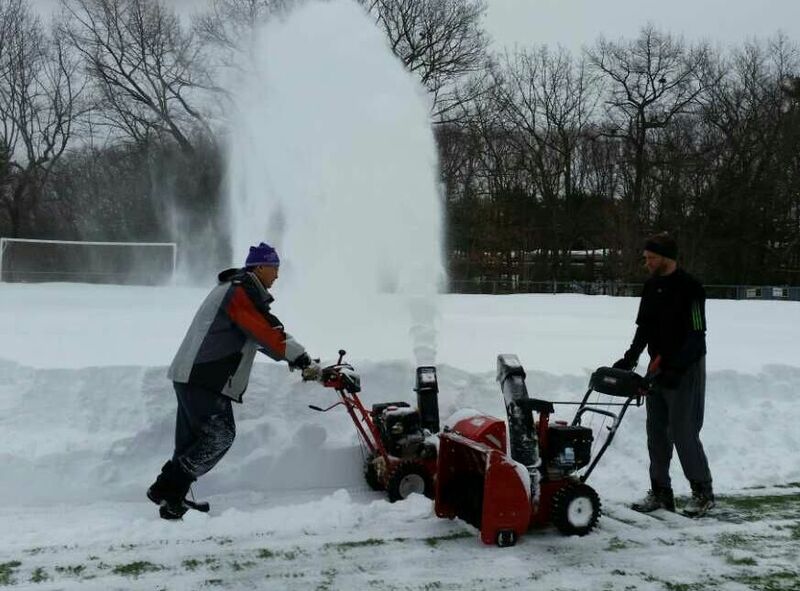 Soccer players clear a field after a blizzard in early 2015. Upon the advent of Chinese New Year (2/8/2016), an indoor soccer tournament will be held by Boston CSTAR Youth Club to celebrate this traditional Chinese holidays. This tournament is for youth of all ages regardless of their skill level. The predetermined date, time and location for this event is Feb 13, 2016; Saturday all day long at Burr Elementary School, 171 Pine Street, Newton MA 02466. Coincidentally, it will be on the first day of NPS February school vacation! * 4 teams will be formed for each age group, and each team will have 4-6 players. * all games will be played 3v3 or 4v4 or 5v5, depending on the total number of participating players. * the final game will be played between the 1st place team and the 2nd place team for 30 minutes. The winning team will be the champion of the CNY tournament. Please register your child for this event, so the organizers know the total number of participants. Participant don’t have to pay to attend this event, but your registration is required more likely for holding a place. Please sign your player up for this event! Additionally, please sign up under a popup window as a coach or a general volunteer. Volunteering is the main factor that we can keep this event at no/low cost! Thank you much in advance! If you have any questions please feel free to send them over to CSTARYOUTHCLUB@GMAIL.COM.